I actually get to show you SOMETHING that I'm working on right now... There are 3 other complete projects that I am longing to share, but the weather hasn't been cooperative for taking pictures (outsides ones), or my timing has been all wrong... so I'll have to leave you hanging on those ones (you can actually see a peek of one of the projects in the photo...). It's raining today, so snuggling up with some yarn is completely appealing to me... after lunch I will hopefully get to it. Both boys will should be asleep then, so I will have some time to myself for a hour or so. I started this one the weekend... and have already frogged it three times. I think I had forgotten how to knit with DPN's... does anyone else find them a pain to work with? Give me a hook PLEASE!!! 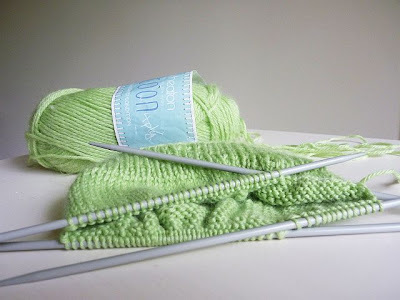 LOL Then there was the little placenta brain problem that made me cast on the wrong number of stitches (smacks hand on forehead), and while knitting and watching Grand Designs, I... um... started knitting in the opposite direction (after twisting a stitch - How did I not notice that??? I ask you. lol) Anyway... we are on the way. Hope to have this one finished by next week (I'm a slow knitter, I admit it.). Hope your day is abundantly creative! See what other people are creating today over at Our Creative Spaces. That looks and sounds complicated... all the best with completing it. The leather is from 'Birdsall leather & craft' http://birdsall-leather.com.au/home.php If you're in Sydney I highly recommend visiting the tannery, you can look down into the factory area from the showroom... very cool! DPN's scare me, so I applaud you for using them! Looks like a sweet little hat, and that shade of green is just lovely. good on you, looking lovely on the sticks! The color is serene! Very nice! 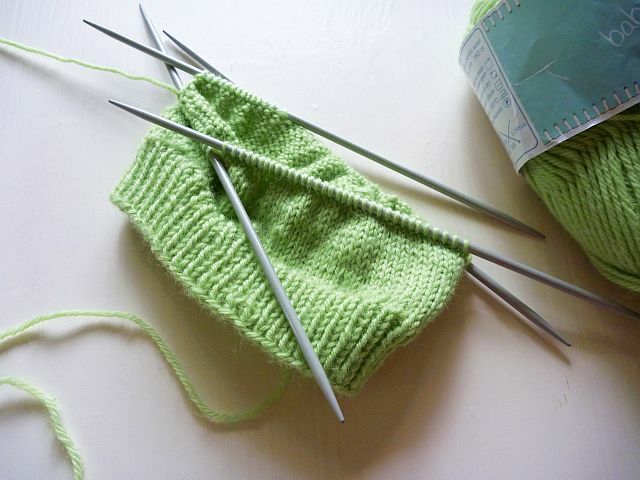 And even if you are slow at knitting you are still faster than me! I've not really taken the time to learn but have always thought I should. Charming blog! It's a wonderful green color! Love the color! Curious to see your progress.